A mom's viral Facebook post is highlighting the way mass shootings affect even the youngest children. 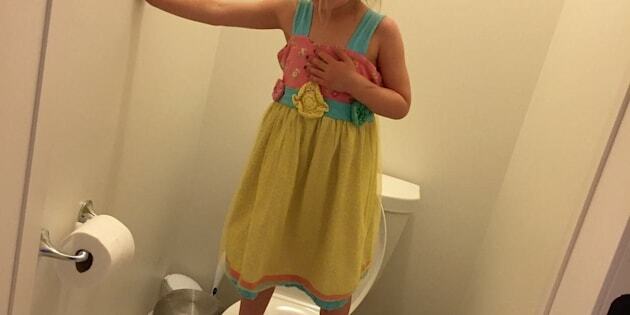 On Wednesday, Stacey Wehrman Feeley posted a photo of her 3-year-old daughter standing on a toilet in their house. She explained why in an eye-opening caption. "I took this picture because initially I thought it was funny," the mom wrote. "I was going to send it to my husband to show what our mischievous little three-year-old was up to. However, the moment she told me what she was doing I broke down." "She was practicing for a lockdown drill at her preschool and what you should do if you are stuck in a bathroom," Feeley explained. "At that moment all innocence of what I thought my three-year-old possessed was gone." The mom implored politicians to "take a look" at her photo. "This is your child, your children, your grandchildren, your great grandchildren and future generations to come," she wrote. "They will live their lives and grow up in this world based on your decisions. They are barely 3 and they will hide in bathroom stalls standing on top of toilet seats. I do not know what will be harder for them? Trying to remain quiet for an extended amount of time or trying to keep their balance without letting a foot slip below the stall door?" Feeley launched into an earnest plea for action, calling for universal background checks, a universal registration database and limits on access to high-capacity magazines. "No one thinks gun control will be 100% crime control. But maybe, just maybe, it helps 1% or 2% or 50%? Who knows unless we try?" she wrote. From evoking the United States Constitution as a "living document" to asking about the NRA's role to mentioning mental health, Feeley makes it clear she will have whatever conversation it takes to impel political leaders to action. She writes, "I applaud politicians like Senator Chris Murphy, but so many of our elected politicians can't manage to work together (maybe they shouldn't be paid for a job they can't do ... just saying) or since they are in bed with all the wrong people, it is up to us if we want change." To that end, the mom asks, "Can I help?" Addressing "entrepreneurs," "innovators," "incubators" and "investors," Feeley writes, "Can I help? Can I help you make a difference? I want to offer support. I cannot give you techie advice, expertise in healthcare, or financial backing, BUT maybe I can point you in the right direction? Maybe I know someone who knows someone who can help?" "I am not pretending to have all the answers or even a shred of them, but unless you want your children standing on top of a toilet, we need to do something!" she concluded, asking others to share her post and adding the hashtags "#dosomething" "#prayfororlando" and "#wecandobetter." Feeley's impassioned Facebook post has received over 8,200 likes and 11,300 shares. Here's hoping her powerful words translate into powerful actions.